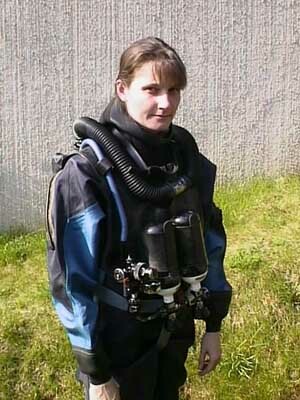 The Draeger Norge II (article no Draegerwerk T5650) is an Oxygen Closed Circuit rebreather. The Lt Lund II is the successor of the Lt Lund I and the model 138, the latter was the classical Barakuda tauchgeräte (for more info, see the excellent www.therebreathersite.nl ) that the well know Austrian photographer and film maker Hans Hass used in the 1940's. According to G. Haux "Tauchtechnik" the Lt Lund was developed 1953 - 54 in collaboration with the Norweigan Navy and Leutnant Lund. 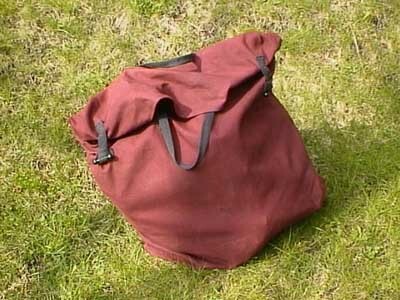 The Norge II unit comes in an early version with a canvas breathing bag and a later (shown below) with a fabric reinforced rubber breathing bag. The weight of the complete unit is 15 kg. The duration based on a 2 L/min oxygen consumption is 90 min. For a more leisurely swimming pace the duration is >3 hours. 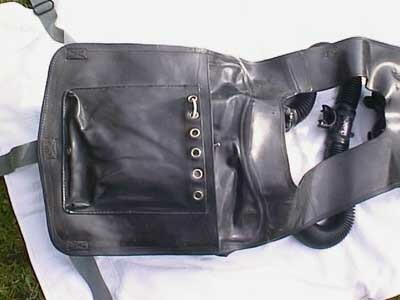 The Norge II is donned over the head, waist and crotch straps meet in a quick release buckle under the tanks. The tanks are two 0.8L 200 bar oxygen. The unit does not have a demand valve but has a constant mass flow of O2 (nominally ca 0.9 L/min) and a manual bypass. For recreational use the flow rate is set to about 0.3 L/min (i.e. resting metabolic rate) and the manual bypass is used to add oxygen when needed. 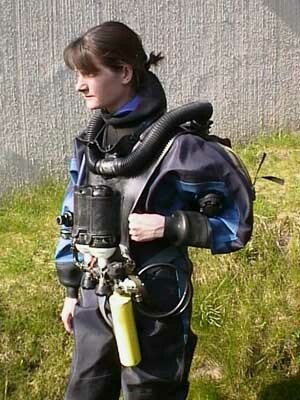 The unit is dived with a squeezed dry suit and a small air tank as buoyancy backup. 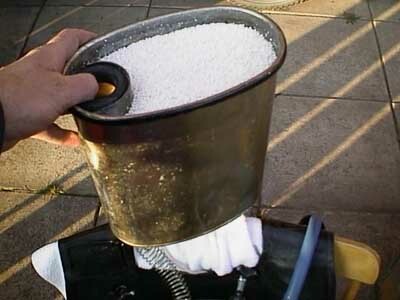 The scrubber canister is housed inside the breathing bag. 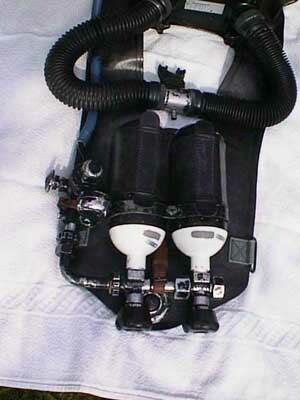 The inhalation hose is on the right side and the gas is scrubber in the inspiratory limb. 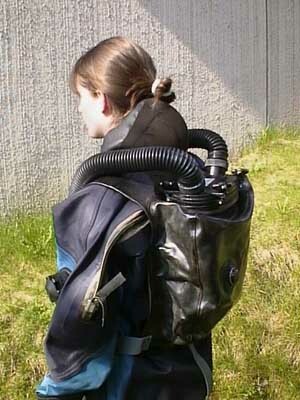 The dump valve is placed in the breathing bag and opens at a pressure of 15 cmH2O. The total volume of the system is 11L. The unit laid out flat. 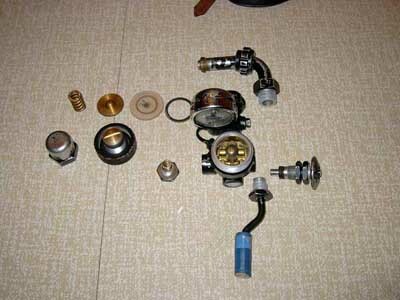 The regulator with manual bypass shown. Between the tank valves the quick release button for the harness (waist and crotch straps) is hiding. The pressure regulator also holds a pressure gauge (the shining thing close to the white on the tank). The blue hose to the left is the oxygen feed from regulator to bag. 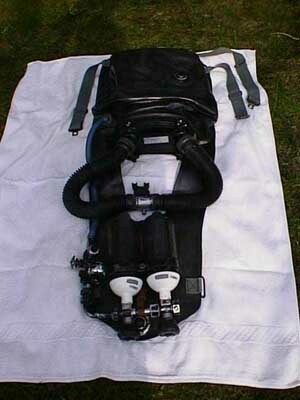 The breathing bag from the under side. The pocket is intended to house weights but the guys who dove the unit operationally tells me that they were not allowed to use it. They had a weight belt that they could drop if needed. The unit is slightly negatively buoyant with a full breathing bag. 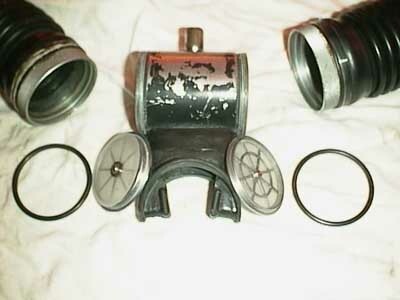 DSV with non-return valves. The original rubber ones were rotten so I made a punch and made flat ones from 0.3 mm silicon sheet. I made a T-shaped holder (see below) that was screw fastened (M2) (and locked using red nail polish). All parts in stainless steel. These valves are VERY good. Canister and lid. The exhaled gas on the left goes into the bag. The bottom of the canister is a water trap. The bag can hold LARGE volumes (>litres) of water without soaking the sodalime. The canister is lifted out of the bag for filling and emptying, it holds 3.8 L (!) of sodalime. 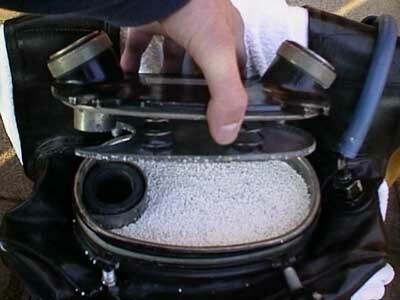 The canister has a spring that ensures that the flow path for exhaled gas is not restricted by a collapsed bag. The same design is found in the FGG/FGT as well as the Dolphin/Ray. A good device comes with all the tools needed for disassembling. A nice canvas bag is also part of the package. 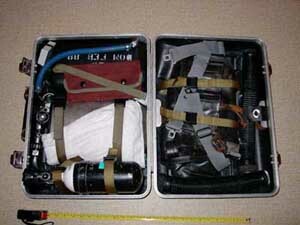 I use my own hard case that houses everything I need, to the left: tanks, canister, regulator, DSV, tools, and sodalime. 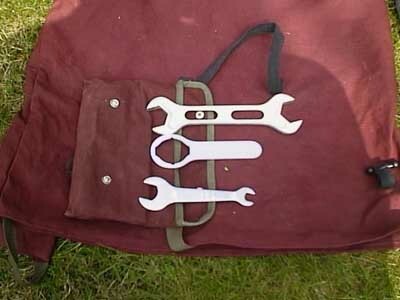 To the right the folded breathing bag and hoses. 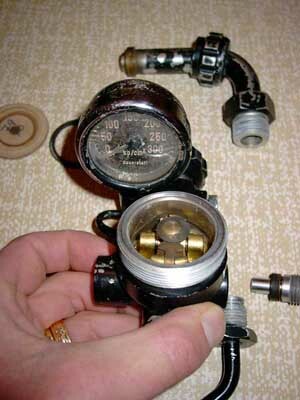 The regulator is a non-ambient referenced and is nominally set to 4,5 bar which will give a 0.9 L/min flow of oxygen. The flow is adjusted by changing the pressure. 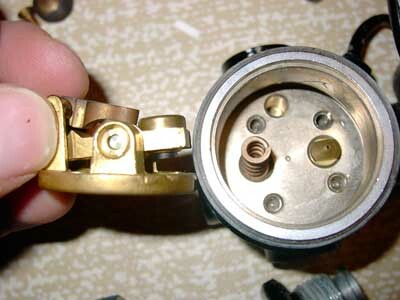 Open regulator housing with the Draeger rocker (also called the "Z") mechanism showing. The orifice (ca 0.5 mm diameter) and a close up on the rocker. Service Manual Operations and service manual for the Draeger Norge II, both are in Swedish but do not let that stop you! The Service manual shows pictures and assembly drawings and should be readable also for a native English speaker. Most of the service manual is also applicable to the Draeger lt Lund I & II.